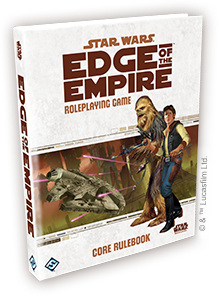 The Star Wars®: Edge of the Empire™ Core Rulebook provides everything you and your friends need to experience life in the shadiest and most remote locations in the Star Wars universe. Thousands of places across the galaxy exist on the Edge of the Empire where the influence of the Core Worlds’ laws and regulations are dimmed or muted. These places are populated by figures who live on the fringes of both the galaxy and its society. Such shady locations attract shady characters, but they also lure those independent thinkers and insurgents who seek to break free of Imperial law. 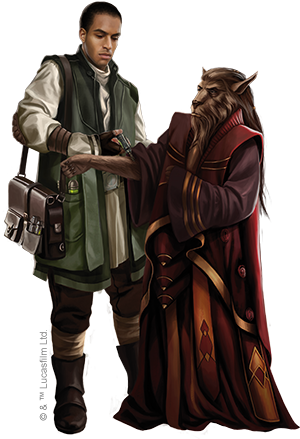 In an Edge of the Empire campaign, bounty hunters, smugglers, mercenaries, and explorers may find themselves working alongside doctors, politicians, and scholars. Throughout the course of an Edge of the Empire campaign, your character is likely to face all manner of difficult challenges and choices. You may be asked to help a host of escaped prisoners establish new colonies in the Outer Rim, building new lives where they conduct their business outside the grasp of Imperial law. To earn your next meal, will you be willing to work for a Hutt gangster? Perhaps you’ll double-cross your employers and have a run-in or two with hired mercenaries and bounty hunters. Will you support the growing insurgency by helping smugglers transport illegal cloning technology to Coruscant’s underworld? Will you be those smugglers? Edge of the Empire isn’t just about adventures that take place outside the Core Worlds, it explores the lives and adventures of all those who live outside the comforts of established civilization or the law. Accordingly, you’re likely to run into characters, both good and bad, who share dark secrets, owe large debts, and have reason to run from powerful enemies. Some of them may even become your friends or allies. Life on the outskirts is full of surprises, and your adventures in Edge of the Empire will often lead to any number of challenges, from sneaking smuggled medicine past an Imperial blockade, to piloting a ship through an asteroid field, to coaxing vital information out of hired thugs without starting a cantina brawl. Characters must rely on their innate abilities, trained skills, and special talents to survive. 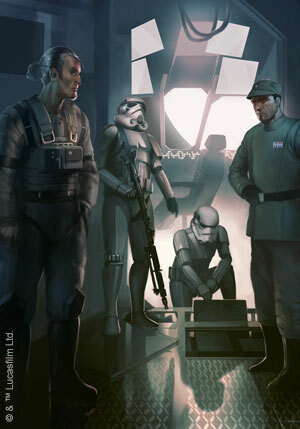 The Edge of the Empire Core Rulebook is a fully self-contained reference that allows players and GMs to enjoy whole campaigns in the Star Wars galaxy, from the simplest combinations of adventures to vast, sophisticated explorations of life in the Outer Rim and at the fringes of society. You’ll build characters, encounter memorable adversaries, and confront your destinies. 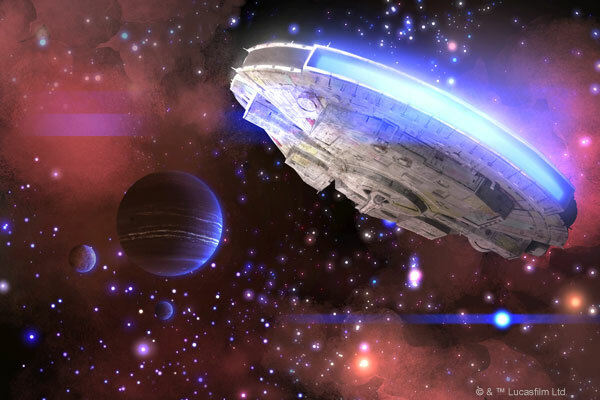 Players looking for more action and adventure can explore even more of the galaxy in Edge of the Empire supplements. Your campaign may grow with additional adventures. These books further explore the game's setting, and players will gain more options for building and advancing their characters. Everyone has debts to pay. Everyone has secrets, and everyone has the potential to do something great. In Edge of the Empire, your characters will have their chances to pursue their destinies as they’re thrust into adventure with some of the galaxy’s least likely heroes. Character creation in Edge of the Empire works from the assumption that each character enters his or her first adventure with a history. 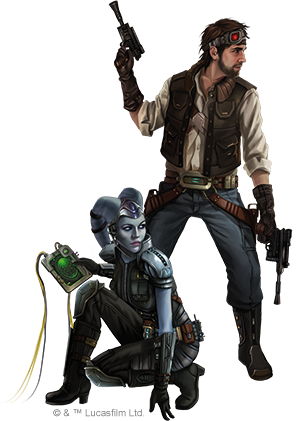 You may play a Bothan explorer, a Gand scoundrel, a Twi’lek bounty hunter, a Human colonist, a Droid outlaw, or a character that no one but you could possibly imagine. But one truth carries across the spectrum: whoever he is, wherever he came from, your character is likely to be burdened with the baggage of some pre-existing obligations. What caused your character to enter into the nebulous and dangerous world of Edge of the Empire. Was it a single, traumatic event? Was your character put into an untenable situation from which he had to flee? Is your character racing to pay off old debts before those debtors come calling? Your character’s obligations represent the debts he seeks to avoid or repay. They likely impacted your character’s original decision to seek out adventures and the fame and fortune that adventure promises. And your Obligations can definitely shape the course of your character’s life. Obligation in Edge of the Empire ties the game’s mechanics to a narrative core and helps players develop characters with rich backgrounds and deep investment in the campaign’s events. Each Edge of the Empire campaign is loaded with potential for rich and exciting stories of heroism, betrayal, redemption, questionable morality, and mercenary greed. Edge of the Empire characters are tough, savvy, and resourceful. They’re likely to know a few tricks, and they’re probably going to have to know when to make good use of them. The core mechanic of the game is the skill check. At times, the GM will have the characters roll pools of dice to determine whether their actions succeed or fail. Whenever you roll a skill check, you compare a pool of “positive dice” and their results against the results of a pool of “negative dice.” Positive dice help your character accomplish a task or achieve beneficial side effects. These dice may reflect his innate talents or abilities, special training, superior resources, or other advantages that you can apply to the specific task. Negative dice represent the forces that would hinder or disrupt you, such as the inherent difficulty of the task, obstacles, additional risks, or the efforts of another character to thwart the task. If your character’s successes ( ) outnumber his failures ( ), the action succeeds. However, the situations of Edge of the Empire are rarely simple, and the game’s custom dice do more than determine whether an action succeeds or fails. Even as the dice indicate whether an action succeeds or fails, they determine if the character gains any Advantage ( ) or suffers any Threat ( ) as the result of the attempt. With Advantage and Threat, each skill check is loaded with myriad dramatic possibilities. Your character may successfully repair the transfer circuits in his ship just in time for a dramatic jump to lightspeed only to come out of hyperspace in the middle of an asteroid field. He may take a wrong turn into a dead-end alley while trying to outrun a pair of Gamorrean mercenaries but discover that the Gamorreans are susceptible to bribes. Or he might find that he not only wins a high-stakes game of sabacc, his victory happens to impress the club owner who knows the secrets behind a large and valuable shipment of blasters. The sheer number of possibilities provide opportunities to narrate truly memorable action sequences and scenes. These layered results move the story along and inspire details and special effects that create action-packed sessions. Edge of the Empire is the first of three standalone, but fully cross-compatible roleplaying systems. Each introduces a unique dimension of the Star Wars play experience, but the core mechanics are fully interchangeable. Players and GMs will have the option to use these materials separately or combine them as they see fit in order to carve out a unique, custom roleplaying experience. 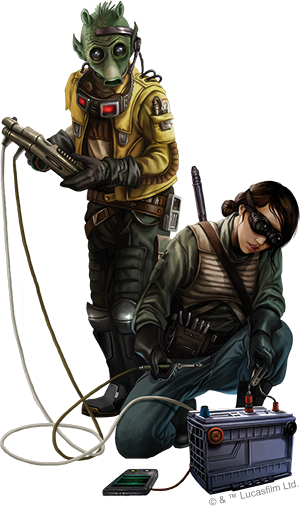 The Core Rulebook for Edge of the Empire allows players to create characters with checkered pasts and deep obligations, and it invites them to experience the thrills and adventures of life on the outskirts and the fringes of the Star Wars galaxy. Star Wars®: Age of Rebellion™ allows players to take the fight to the Galactic Empire as members of the Rebel Alliance, and Star Wars®: Force and Destiny™ permits players to assume the burden of the last surviving Force users who are hunted by the Empire and must fight for survival even as they seek to uphold the ideals of their forebears—the fabled Jedi. 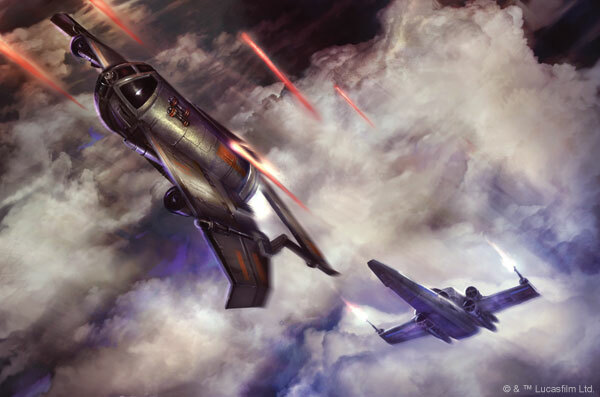 Meanwhile, players of the Star Wars®: Edge of the Empire™ Beginner Game will find that the Edge of the Empire Core Rulebook unlocks whole new worlds and fantastic opportunities for adventure. Whereas the Beginner Game is designed to introduce players to the most basic concepts of roleplaying in a Star Wars setting, the Edge of the Empire Core Rulebook provides all the materials players and GMs need in order to continue their adventures or begin new ones. The Core Rulebook’s rules for character creation and advancement allow players to invent unique characters to suit their tastes, and its rules for character obligations and motivations add layers of excitement and engender storytelling. 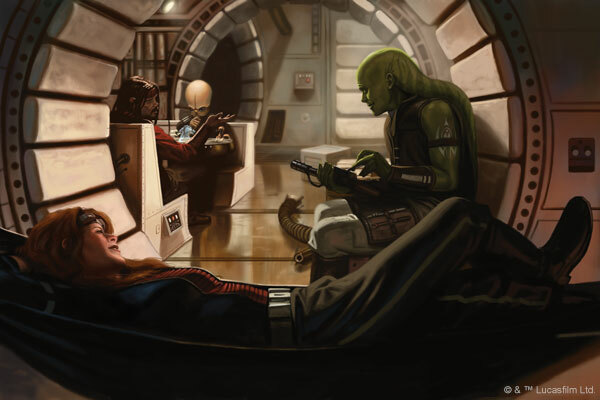 In addition, Star Wars®: Edge of the Empire™ Specialization Decks provide GMs and players with an easy way to manage character and NPC talents at the gaming table. New and experienced players alike will appreciate these handy reference cards, and GMs will love being able to keep the action moving. The career specialization talent trees available in the Edge of the Empire Core Rulebook and its supplements allow you to craft a one of a kind character. Throughout your adventures, your talents help you successfully navigate the many challenges life throws your way. No matter your background, Specialization Decks allow you to reference these talents at a glance, so you can remain focused on the action. Get ready for life as an outlaw, a scoundrel, a colonist, or another of the many characters who work and travel in the shadiest parts of the galaxy. You’ll need to rely upon your wits, your blaster, and your companions… Action and adventure await those who live at the Edge of the Empire!